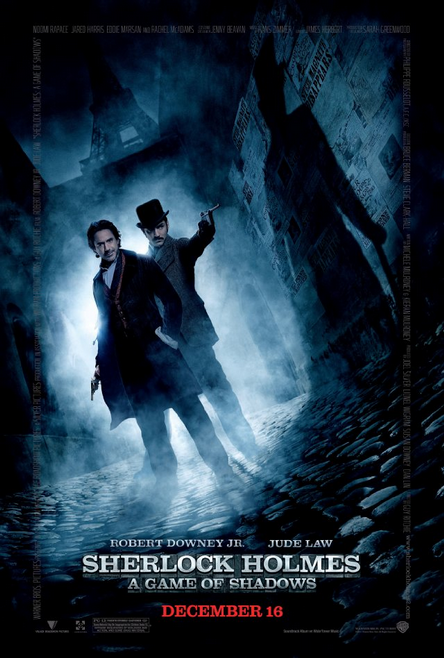 If you liked director, Guy Ritchie's first outing with Robert Downey Junior and and Jude Law as Sherlock Holmes and Doctor Watson respectively then Sherlock Holmes: A Game of Shadows is a must see. As per usual this is not a complete review of the film. If that's what you're looking for then head on over to the Internet Movie Database where you'll no doubt find many user reviews. This is just a few of my thoughts post seeing the movie. Warning there could be spoilers to follow - stop reading now if you intend to see this film and don't want to go in with too much prior knowledge. I've seen a few reviews of this movie saying it's not as good as the first and I can understand why. The first film was a whole fresh take on Sherlock Holmes that main stream audiences were not familiar with. Guy Ritchie, according to him, brought Sherlock Holmes back to the super genius, action hero that he read about in the original books. It was a far cry from the stuffy English detective we've come to know through many other films - and it was exciting! However in Game of Shadows we're now familiar with this Sherlock Holmes and his world so it tends to be 'more of the same' rather than a feature in the second film. Guy Ritchie is obviously aware of this and knew that this film needed to have a bigger story to help bring the extra wow factor. Going after Dr Moriarty, Sherlock's arch nemesis, in a plot to send the world into war is probably as about a big a story as you can get for the late nineteenth century. Unfortunately it's revealed early on that Holmes has been following Moriarty's activities for quite some time and there in lies the main problem I had with this film. You don't get the same sense that Holmes is ahead of everyone in this film as you did in the first. You also don't really get the same sense of trying to solve a mystery either. In this film it's more a race against time rather than trying to solve a mystery. Even though Holmes is joining the dots on Moriarty's plan as he goes. If you look at the film as an exhilarating ride then it's fabulous fun. If you were hoping to match wits with Holmes, attempting to spot the clues and solve the crime before he does, then the first film allowed you to do that much better. There's not too much to solve in the second. It's a game of chess not a mystery. You're basically watching to see what each person's next move will be. I can say I did enjoy the film but I hope, if they decide to make a third film, they take a leaf out of the humongous book that is The Pirates of the Caribbean movies. In that series, the makers realized they'd gone about as big as they could go with At World's End so for the next movie they scaled everything back and just told a good Captain Jack Sparrow, Pirate tale in On Stranger Tides. A third Sherlock Holmes movie would be great if they scaled it back and just told a good story with a real mystery to solve. It can still have all the action - as the first film demonstrated - but it kind of needs that challenge of trying to solve the mystery before the greatest detective in the world does. Even though you probably won't because that just wouldn't be right. I love that Sherlock's older brother, Mycroft Holmes (played by Stephen Fry) calls Sherlock 'Shirley'. I don't know why but, in all the years I've known the character, I've never thought of that as a nickname - but it just works with Stephen's delivery and Downey Junior's interpretation of the character. There's a scene where German troops are firing a cannon into the woods, as our heroes are making a hasty getaway, whilst being pursued by troops. It's amazing how accurate the cannon fire is considering the troops firing the cannon have no idea how far away to aim and that their target is moving. Spectacular scene though. Probably wouldn't be anywhere near as exciting if the cannon fire was falling far short. Sherlock's experimentation's with camouflage clothing. Whilst effective for cinema audiences viewing a scene from a specific vantage point, that kind of camouflage is less effective once you start changing the vantage point. The second time you see Holmes utilize a camouflage suit I just didn't buy that he'd be able to pull that ruse off in the relatively well lit room he's in. Overall I did like this film. It's a fun second outing for this version of Sherlock Holmes. It does, however, make me want to actually read the books, just to see if Holmes really is the action man Guy Ritchie says he is.